Let’s have a toast! Let us raise our Flutes, Goblets, Glasses, and Tumblers- but wait, what’s the difference? Yeah, that IS a good question! Why would you choose a Goblet over a Flute? Or a Glass over a Goblet? What makes each of these tonic trollies unique from the other and where are they best served at your table? Well, don’t worry, because we have good news: today, we’re going to take you through our stemware and drink-ware categories to take a look at the definitive features of each class. Let’s get started! Playing on the classic, slender shape of its musical namesake, the flute is narrow and delicate. The bowl of the flute is often very narrow, and the stem elegantly tall. 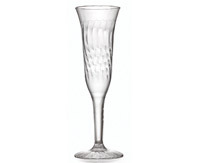 This particular style of stemware is used to serve champagne, sparkling wines, and certain quality beers. Our Flairware Champagne Flutes can be used as an example of just how beautiful this style of stemware can be. The methodology in utilizing this particular stemware to serve carbonated drinks are due to a process known as Nucleation. The special shape of the flute is, believe it or not, actually partially responsible for the trademark bubbles you see in your favorite champagne. This particular style of stemware often ignites fanciful visions of Arthurian dinner and dancing; or adventures in search of legendary treasure. However, the goblet is a great deal more modest a guest at your table than you may think- but that doesn’t mean it is any less significant! The Goblet, also known as a chalice, can host both wine and water, and can have a variety of stem types ranging from squat and wide, to tall and slender. The common theme in which all Goblets share: a round, wide-bottomed bowl, and the archetypal stem. An example of the most collective Goblet design can be found in our Flairware 5 oz Wine Goblet. 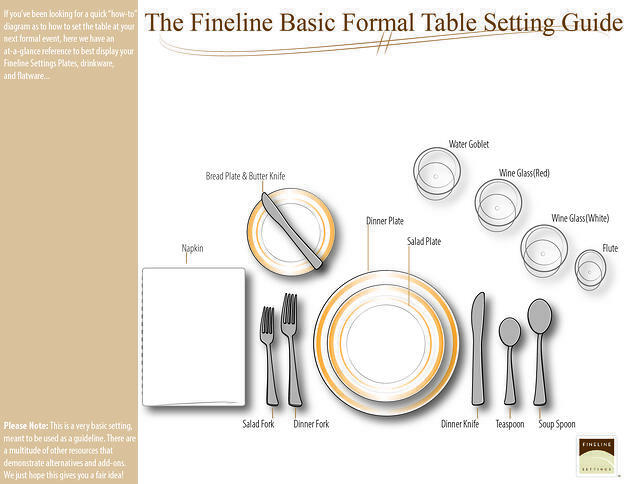 At a modern table setting, it is often used to serve water throughout each course. This is, perhaps, the most common term used to describe the entire array of different stemware we’ve discussed thus far. However, the wine glass is, perhaps, the most unique and yet varied of the classes. With its many subclasses and etiquette, there is more than enough to share with you today that will show this classic treasure very much deserves its own lime-light! Wine glasses come in many shapes and sizes; there are even different styles of glass pending on whether you are drinking red or white wine! Let’s take a look at some of the differences. When it comes to one of the biggest variances between the two: a proper Red Wine Glass is often taller and fatter with a long stem; while the White Wine Glass tends to be a bit more demure with its narrower bowl and shorter stem. Wine glasses in general often have an oblong, wide-bottomed bowl that tapers inward toward the top and a long stem; there are stem-free versions that can be considered, as well. All quality wine glasses are designed specifically so that the drinker may best enjoy the aroma of wine; as the narrow opening helps to contain the fragrance and helps focus it toward your nose and mouth. To see an example of a more unique take on a Wine Glass, our Wavetrends 8 oz Wine Glass gives an edge to the classic style of the Wine Glass. This is, perhaps, the most iconic shape of all in our psyche when it comes to taking a drink. Most of our day-to-day beverage consumption is served using the common, sleek, stem-free drinking glass/tumbler. With its numerous styles, sizes, and colors ranging from: tall and slender, wide top/tapered bottom, wide-bottomed/tapered top, curvy, or square, this particular apparatus is used most effectively for juices at a formal table setting. The Tumbler is distinctive due to its stem-free design. It is, most commonly, a straight-edge, oblong bowl with a large top diameter and a smaller bottom diameter, such as our Savvi Serve Tumblers, or our Renaissance Crystal Tumblers. While you may have a Wine Glass, Water Goblet, and a Flute sitting at your table; the Tumbler will be your companion in serving orange juice, tomato juice, etc. WHAT MAKES STEMWARE PARTICULARLY UNIQUE IS THE STEM ITSELF. A common attribute all of our aforementioned classes share (with the exception of the tumbler) is the stem. While it is a beautiful and fashionable touch, it also has a very important and surprisingly obvious purpose: the stem is provided so that the warmth of your hands does not affect the temperature of your beverage. Pretty cool, right? We hope now, as you make your selection of our products for your next event, you will be able to set your table, and serve your guests, with the confidence that knowledge brings. 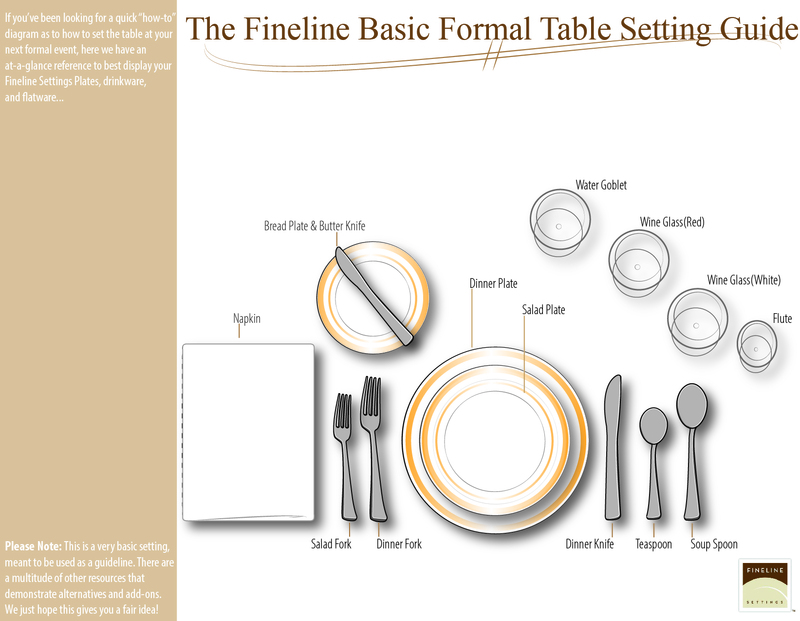 After doing some research, we here at FINELINE SETTINGS have drawn up our own illustration for a quick table setting guide to help get you on your way. There are a multitude of different ways to set your table, but this composition, we think, helps highlight our discussion this week! So, if you are interested in including all of these stemware heavy-hitters to your next even, take a look! Thanks for joining us this week, and we hope this little chat was as interesting and fun for you, as it was for us! Have a great rest of your day, friends!